Harry’s Magic Tables is a book written by a mum who was struggling with teaching her son, Harry, his times tables. 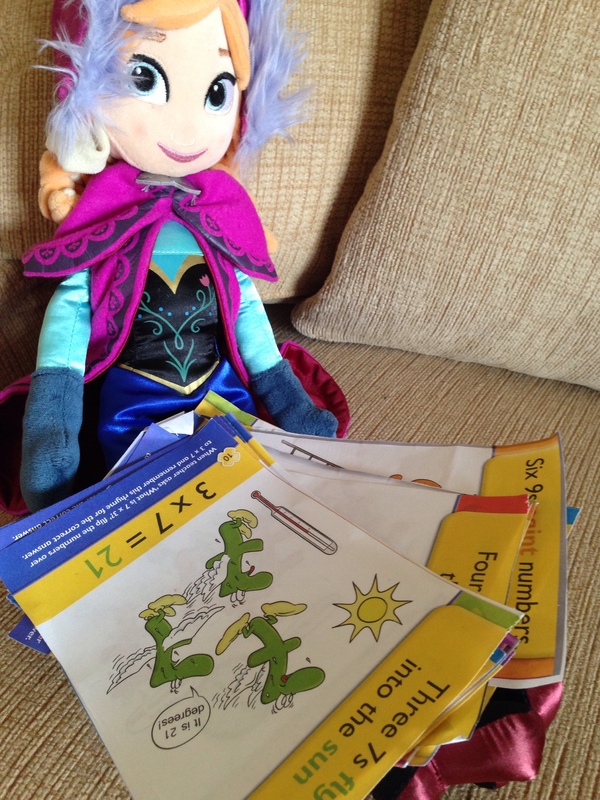 She invented these rhymes and pictures to help him remember. Apparently the little clever clogs learned them all in a week. I’m skeptical of any book that promises an improvement in x amount of time, but nonetheless I won’t let that claim put me off. As long as it works, I don’t care how long it takes–I think that’s the general state of mind of most parents who have kids with dyspraxia. Dyspraxic kids are usually very visual in their learning and recall so the fact that this book has cute and funny cartoony illustrations along with a funny rhyme, should really work in their favour, which is why I picked this book to help my 8-year-old. Maths is a hard subject to make fun, so this approach is worth a shot, right? My first impression of Harry’s Magic Tables is one of confusion, and although my daughter has flicked through it, I think she too was a little confused that the book is not more logical. We are currently trying to perfect the four times table, and there’s no immediate page you can jump to. The contents page lists chapters like ‘flying rhymes’, ‘running rhymes’, ‘jumping rhymes’ etc. Well what does that mean? Eventually, I located “Running rhymes: when 4 is the lower number in the table.” The problem with this is that it starts with 4×4, presuming that a child will already know all the other rhymes before 4×4 and will understand that 4×3 is the same as 3×4. Well, that may be obvious to some children, but I don’t think it is obvious to the mind of a dyspraxic child. So by the time you get to “Swinging Rhymes: when 9 in the lower number in the table”, there is only one rhyme to learn: 9×9. At this stage, I think I would have preferred a book that covered all the multiplications so we can easily work through them one by one. I know that would be repetitive, but I think this may work better for all kids with SEN. The book is also much shorter and smaller than I expected. Another negative about this book is that it only goes up to the 9 times table. I understand that there probably isn’t a need for a 10 times table rhyme, but in the UK our kids are supposed to know up to their 12 times tables. And I would suggest that 11 and 12 are the hardest ones to learn. OK, so now it’s apparent that the four times tables are called “running rhymes” because all the multiplications from 4×4 to 4×9 have the number-four characters ‘running’ in the rhymes. I still think it would be easier to do a rhyme from 1x to 10x each number, but hey ho. 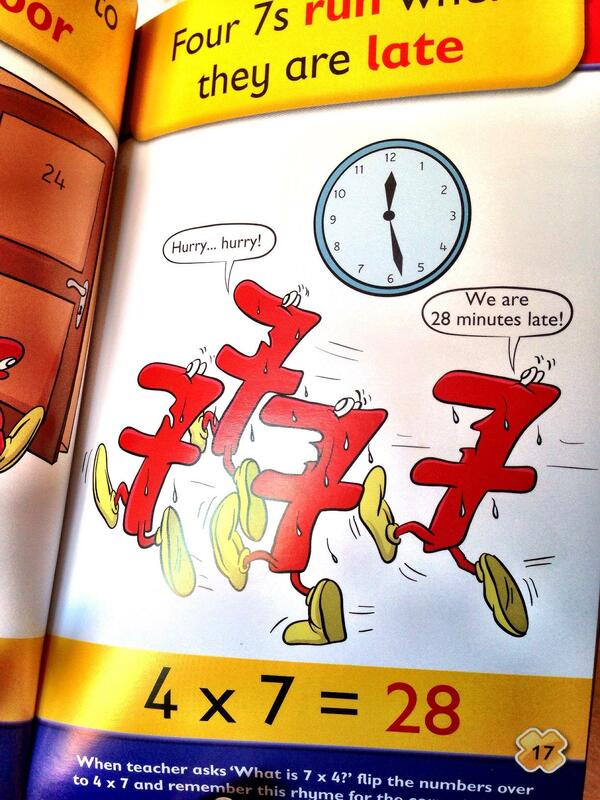 So, for example, Four 7s run when they are late 4×7=28. The idea is that a child will be able to remember that 4s are running rhymes and this might help them to remember the appropriate rhyme, and therefore the answer to that particular question. My little one is enjoying that this is a more fun approach, but it’s definitely going to take some time. I’ve colour copied the relevant x4 pages, which did mean flicking back and forth, and have left them next to her bed in the hopes she’ll take a look when she wakes up (too early) and the pictures might help the information to stick. This approach didn’t work, but I’m still using the colour copies for when we do homework as it’s easier than having to locate the page in the book each time. We’ve been using the colour copied pages when completing “torture tables” every day and some of the numbers do seem to be getting through. Progress is slow, but the rhymes are definitely helping her. I think the rhymes help more than the pictures but it would be a very dull book without the pics! 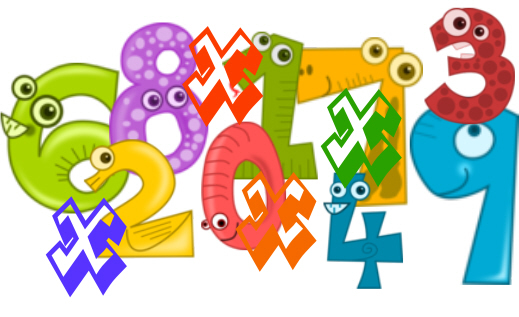 Take a look at our times tables help article if you need some more help.